When you’re searching for cooling tower coatings, tower sealants, or epoxy paint for cooling towers; we can help! Cooling Tower Products offers high quality coatings to help protect cooling towers from corrosion. This epoxy seal paint, is designed for exterior and interior use for the complete cooling tower protection solution. In addition to cooling towers these sealant coatings can be used to protect wastewater systems, potable water facilities, and much more. To learn more about protecting your industrial equipment please get in touch with one of our product advisers. We provide cooling tower coatings, also known as “cooling tower epoxy paint”, and “cooling tower sealant” to help protect and extend the interior and exterior parts of your cooling towers. Coatings help protect components from the corrosive environment. 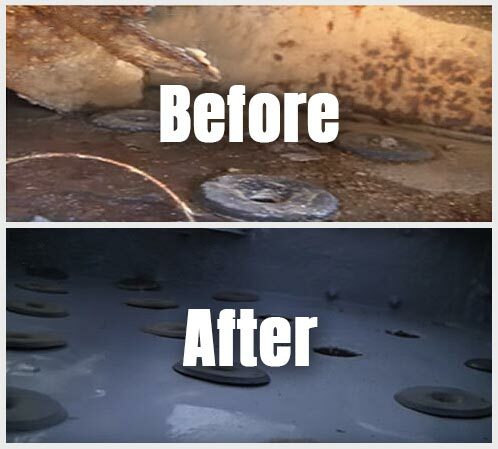 If the interior of your cooling tower tank is corroding, rusting, or leaking, an epoxy coating or cooling tower liner can be installed to seal and eliminate all leaks. Cooling towers heat, moisture, and chemicals are prime conditions for corrosion. Epoxy coatings may be applied to the outside (exterior) of the cooling tower to eliminate corrosion and rust. Protecting both sides of the tank helps prevent corrosion and leaks which will extend the life of your equipment. Our cooling tower epoxy paint can be applied the following cooling tower systems: Collection Basins, Chilled Water Tanks, Packaged Towers, Field Erected Towers, Distribution Decks, Chiller Plants, and Ice Storage Tanks. Our cooling tower coatings can be applied in the following portable water facilities: Clearwells, Clarifiers, Potable Reservoirs/ WaterTanks, Sedimentation Basins, Filter Beds, Filtration Systems, Floculation Basins, Pump Stations, Chlorine Contact Chambers, and Water Softeners. Our cooling tower sealant can be applied in the following wastewater systems: Clarifiers, Equalization Basins, Lagoons, Sedimentation Basins, Sludge Tanks, Digesters, Aeration Basins, Lift Stations, and Pump Stations. Tower Seal will not affect your water chemistry and is not affected by water treatment chemicals. We proudly offer the highest quality cooling tower coating services to help protect and provide corrosion resistance in portable water facilities, wastewater systems, and cooling tower systems. Cooling tower linings help bridge over holes, seams, and cracks and are mostly installed in collection basins and distribution decks to provide a impermeable and corrosion resistant barrier to cooling water. Minimum adhesion is 2750 psi – Tower Seal has a strong adhesion to substrates usually found in cooling towers including galvanized steel, stainless steel, fiberglass, concrete, and previous coated surfaces. Is Tower Seal able to be applied on surfaces other than metal? Yes, it can be used to coat or seal many surfaces including fiberglass, wood, concrete, rubber and porcelain. Can you apply Tower Seal on wet surfaces? No, Tower Seal should only be applied to a dry surface for proper curing and maximum durability. How much coverage area will a single application of tower coating seal? One gallon of cooling tower coating should cover 100 sq.ft. @ 10 mils. How is Tower Seal applied? You can use a roller, brush, or trowel and can be applied with a spray gun if diluted properly. 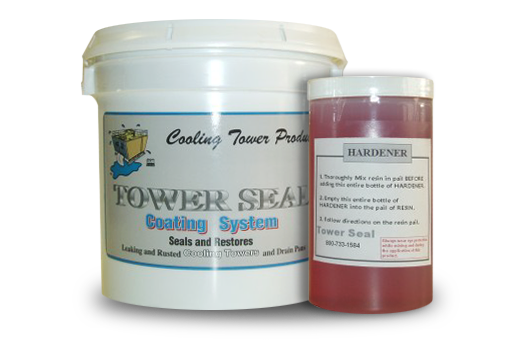 Can your tower sealant be re-used at a later date if I store the product after the hardener and resin have been mixed? No, once the resin and hardener have been mixed, it will continue to harden even in a container that is sealed. How long do I have to apply the coating after mixing the hardener and resin? The amount of time you have to apply the product after mixing all depend on the temperature. Application life: 92 F (30 minutes), 75 F (45 minutes), 40 F (9 hours). Temperature ranges: Service temperature -40 F – 220 F, Application temperature (pre-cure) 40 F-150 F.